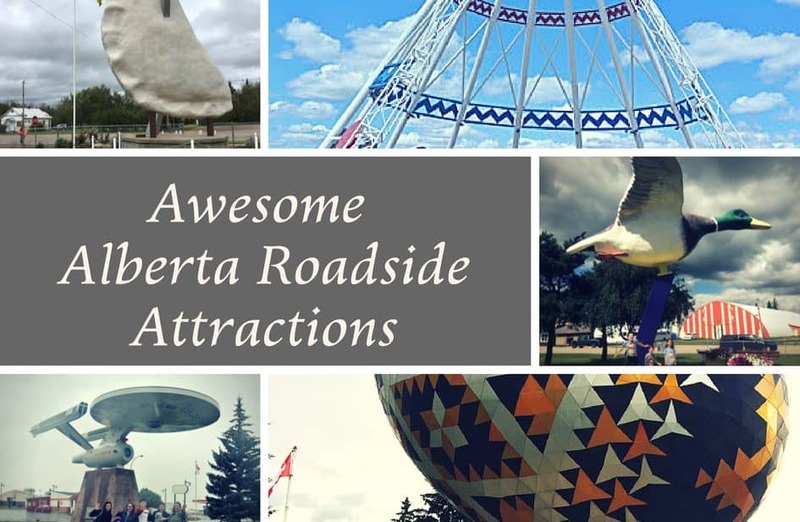 Alberta has a surprising number of roadside attractions than range from beautiful, to truly unusual. We’ve decided to try to collect as many as we can. The one’s we’ve found so far are below along with some helpful tips. There is also a map at the bottom that includes those and a larger list. What is a Roadside Attraction Anyway? There is a lot of wiggle room as to what is considered a roadside attraction. 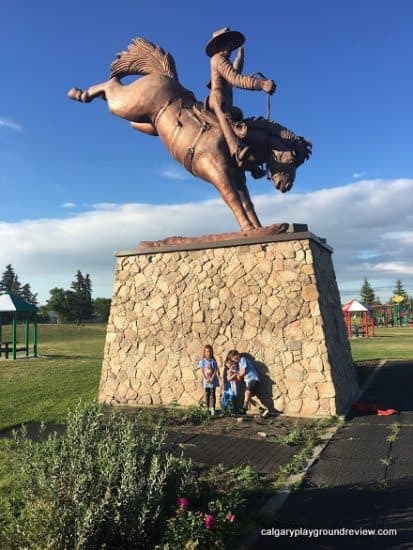 One of the prettiest roadside attractions you are going to see, pays homage to Vegreville’s Ukranian Heritage. 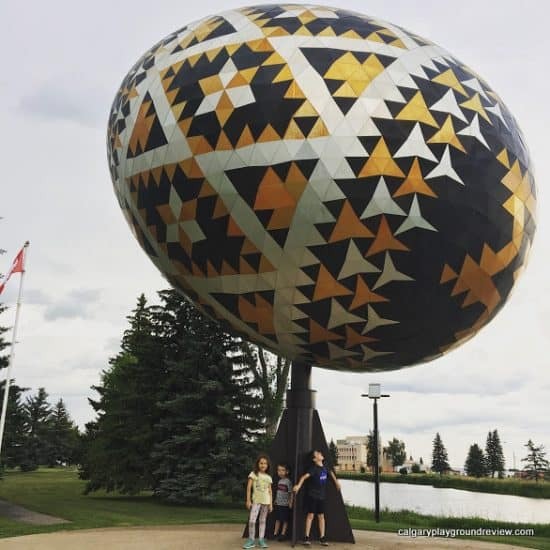 The Giant Pysanka or Ukranian Easter Egg is located at the Vegreville Elks/Kinsmen Park along the 16A highway. There you can also find the Vegreville Tourism office, a nearby bathroom, a great playground and a caboose that you can go inside. If you hit it at the right time you can also find a food truck. Just a couple blocks to the North on 47th St is another great playground with a really tall slide. Way less pretty is the giant sausage in nearby Mundare, located along Highway 855 and just off of Highway 15. 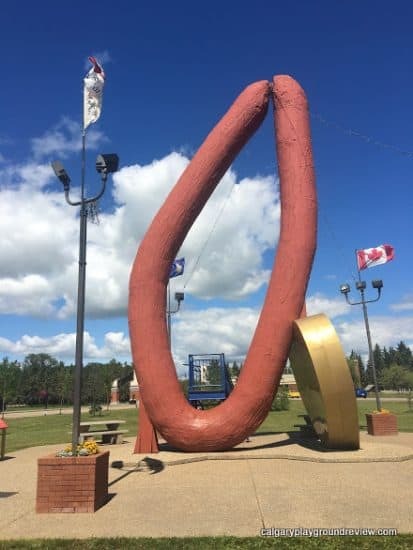 Created in honor of the sausage industry in Mundare. Right next to it you’ll also find a beautifully painted Bison statue. There is a fairly large gas station right across the street making it a reasonable pit stop. While you are there be sure to stop at Stawnichys (the heart of Mundare sausage making) for some snacks for the road. 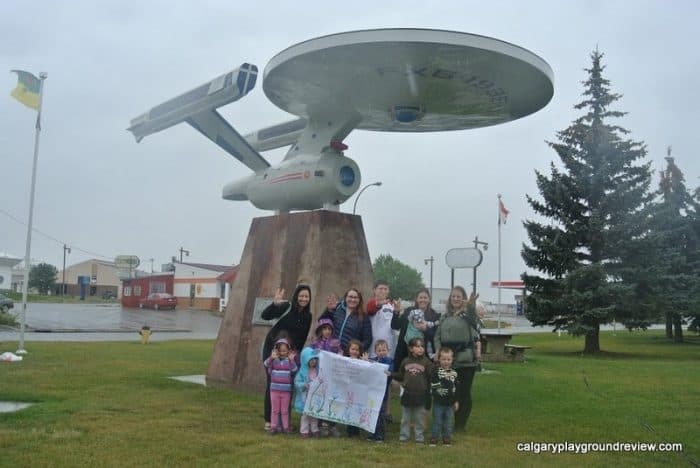 Along Highway 23 in Southern Alberta you’ll find this statue of the Starship Enterprise – when your town shares it’s name with a planet from Star Trek, what else do you do? It’s located near the tourist information centre which also has a Star Trek theme including photo ops. If you are looking for a longer stay, check out their park at 5 Ave N and Centre St – it has an outdoor pool, spray park, playground, sandpit and skate park all packed into one small park. Most roadside attractions are giant statues but not this one, found in the centre of town along Highway 29. St Paul decided to create the World’s First UFO Landing Pad as their town’s landmark as one of Canada’s centennial projects. Right next to the landing pad, you can find the UFO shaped tourist centre which also has a UFO exhibit downstairs (designed to educate) with photos of UFOs, crop circles and cattle mutilations. Need some more space to run around? Check out the park along Lakeshore Drive. This is not a traditional roadside attraction, but if you are within 3 km of Nanton, you can tune into 91.1 FM and listen to the historic Bomber Command Radio. 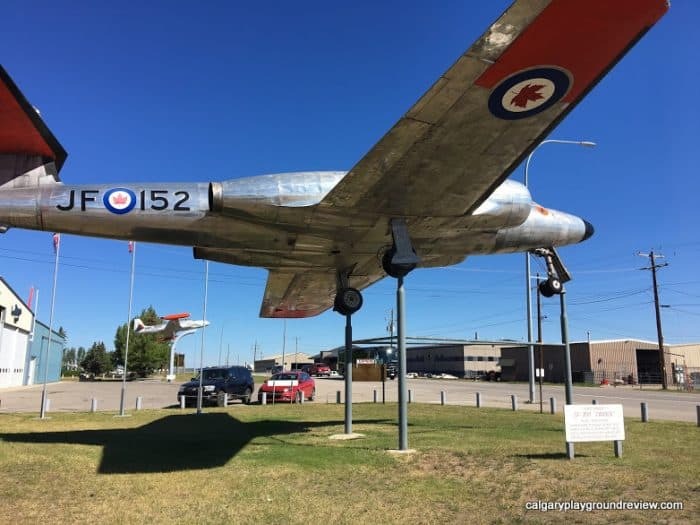 In the past, Nanton also had a Lancaster (a huge airplane) parked outside right along highway 2 which was a roadside attraction in it’s own right. The plane is now parked inside the fantastic Bomber Command Museum, however there are still a couple of smaller planes visible from the outside of the museum. You can also find bathrooms and a nice playground at the adjacent park. Just down the road you can find the famous Nanton Candy Store and old Grain Elevators that have been turned into an interpretive centre. 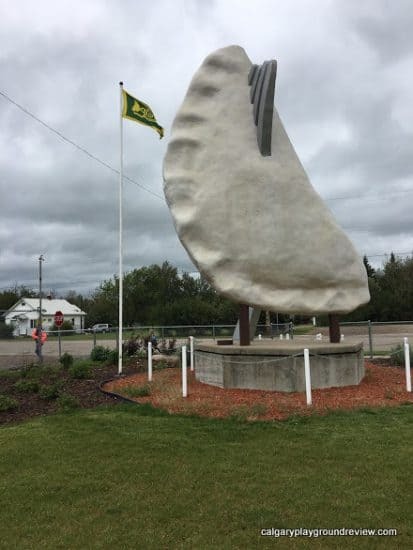 If you are travelling along Highway 28, a short detour North on 882 will take you to Glendon, home of the giant Pyrogy (on a fork!). This is one of my personal favourites. A tribute to the town’s Ukrainian Heritage (watch for the Ukrainian architectural style of the little Ukrainian Orthodox Church as you go through town). Next to the Perogy, you’ll also find a great playground with a zipline and bathrooms (they are in a bit of a nondescript small building near the playground). Seasonally, you can also find JJs Snack Shack food truck (11-7pm) – although not always available, sometimes they even sell fried perogies and perogie poutine. 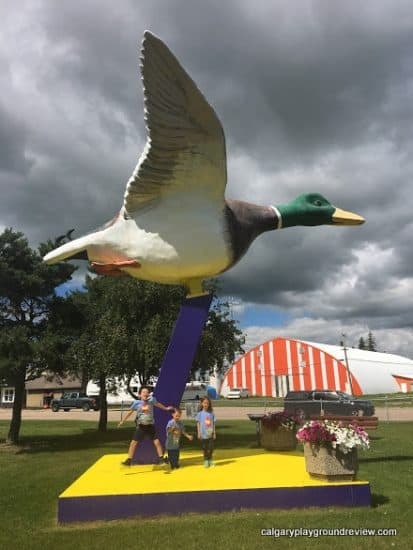 Located just North of Mundare on Highway 855, you’ll find the World’s Largest Mallard. It’s hard not to smile when you are standing under a giant duck. The statue is a nod to the wetlands in the area which are popular mallard duck breeding grounds. Next to the duck there’s a older little playground if the kids need to run around a little bit. 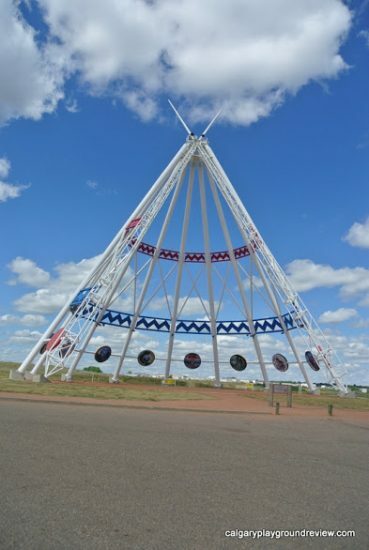 Originally built for the 1988 Olympics (held in Calgary), the Saamis Teepee can now be found along the Trans-Canada Highway in Medicine Hat. The Teepee is just down the road from Tourism Medicine Hat where you can also find a small playground. 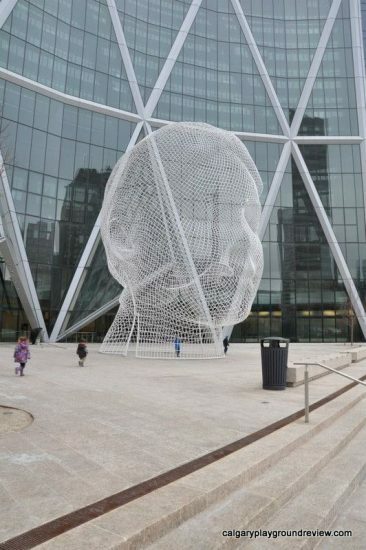 This giant head is a relatively new addition to Calgary (2008) and is definitely more a piece of public art rather than a roadside attraction – (it’s located in the heart of downtown rather than along the highway for one thing). But I’m including it anyway because it is awesome, has free outside access (you can even go inside), is giant and everyone wants to take a picture in front of it. It has quickly become one of Calgary’s icons. Calgary doesn’t seem to really have any true roadside attractions so I am nominating Wonderland as the next best thing. This roadside attraction also called “The Legacy” was dedicated to the strength of the pioneers in the area. 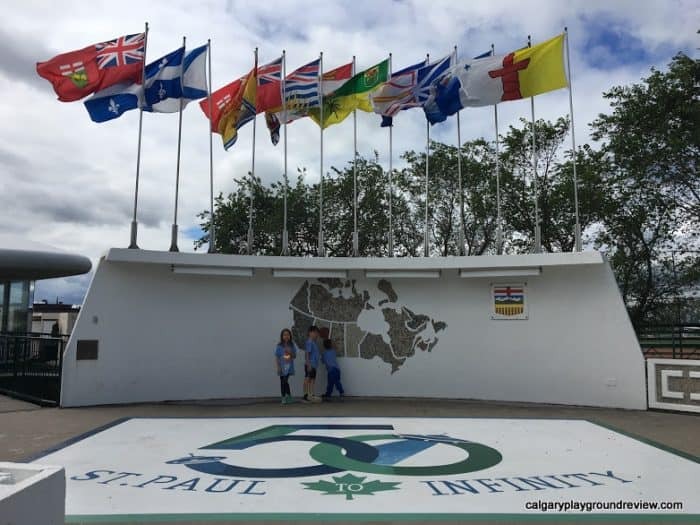 Located along Highway 2A in Lion’s Centennial Park, you can also find a spray park, playground, bathrooms and a mini golf course. On the other side of the highway at the school you can go playground hopping through at least 4 different playgrounds including a brand new playground with an awesome slide. Unlike most roadside attractions, this one is natural rather than man made. It is an enormous glacial erratic – a rock transported far from its place of origin by glacial ice. 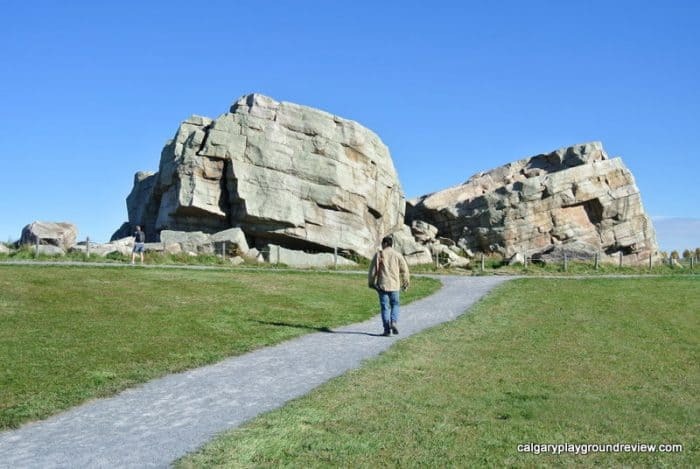 Visible from Highway 7, the Big Rock can’t help but attract visitors. Getting up close used to require a trek through a field but now there is a pathway and parking. Visitors are asked not to climb on the rock. 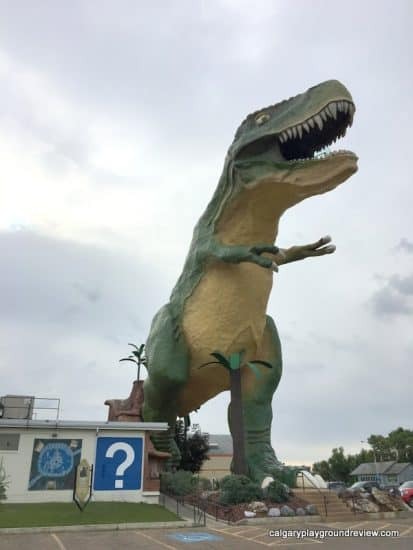 Located just off Highway 56, the World’s Largest Dinosaur in Drumheller is the very definition of a roadside attraction. It’s truly enormous (even bigger than an actual T-Rex would have been) and symbolizes Drumheller’s status as “the dinosaur capital of the world”. Inside the adjacent Drumheller Information Centre you can pay admission to walk up the stairs and peek out the dinosaur’s mouth. Next to the dinosaur, you’ll find an indoor pool as well as an outdoor spray park and wading pool. You can also spot and photograph your family with the extensive number of dinosaur statues scattered throughout the townsite. 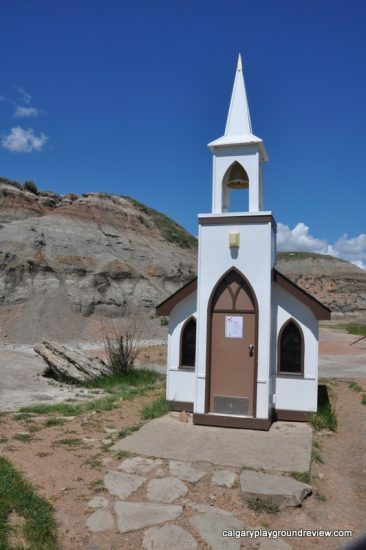 Although most roadside attractions are large, some like Drumheller’s Little Church get attention because of their small size instead. Located along Dinosaur Trail (Highway 838), the Little Church was designed as a place of worship and not just a tourist attraction. Inside you can find seating for 6 and a pulpit. 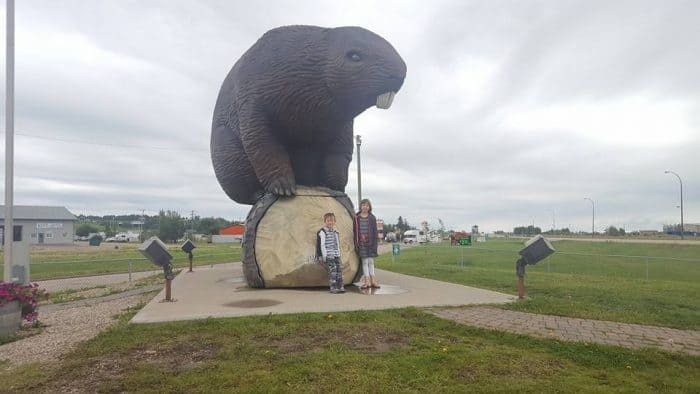 Located along highway 43, Beaverlodge’s Giant Beaver is about as Canadian a roadside attraction as you can get. A short walk away you’ll find the visitor information and cultural centre. Sparwood is actually in BC, but it’s just inside the BC border along the Crowsnest Highway heavily travelled by Calgarians so I’m including it as an honorable mention. It’s not actually the world’s largest truck anymore either, although it did hold the title for 25 years. Most roadside attractions are never used for any practical purpose, this truck however, was used in the local mine until it was retired and moved to its current position as a roadside attraction that’s hard to pass by. You can find the Sparwood Tourism building right next door.